The 'Corinthian Modification' continues to intrigue me. Thucydides(Book 7.) 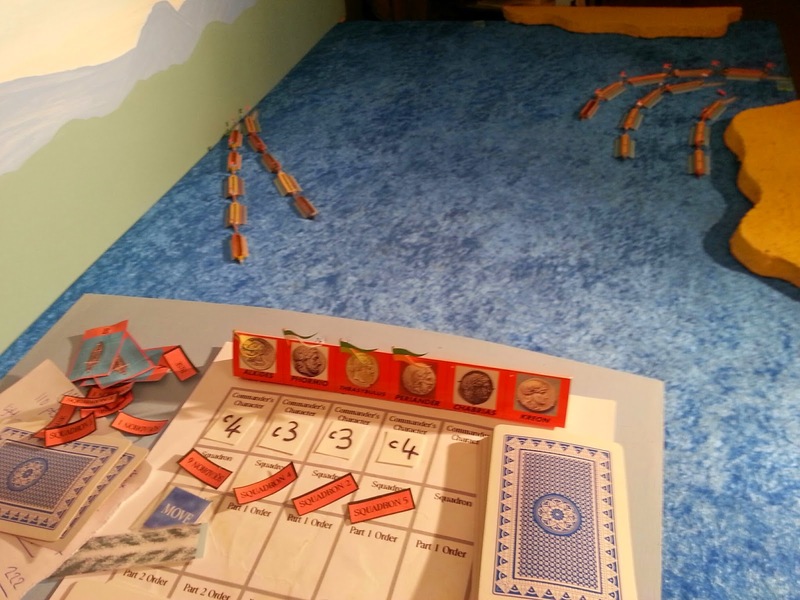 gives a semi-technical explanation of how the Corinthians achieved a 'draw' against the superior seamanship of the Athenians at an engagement off Naupactus led by Polyanthes. They had the 'prows' of their ships built-out 'wider', or 'thicker/stouter'. This allowed the Corinthians to ram their opponents head-on without fear of damagiung themselves. 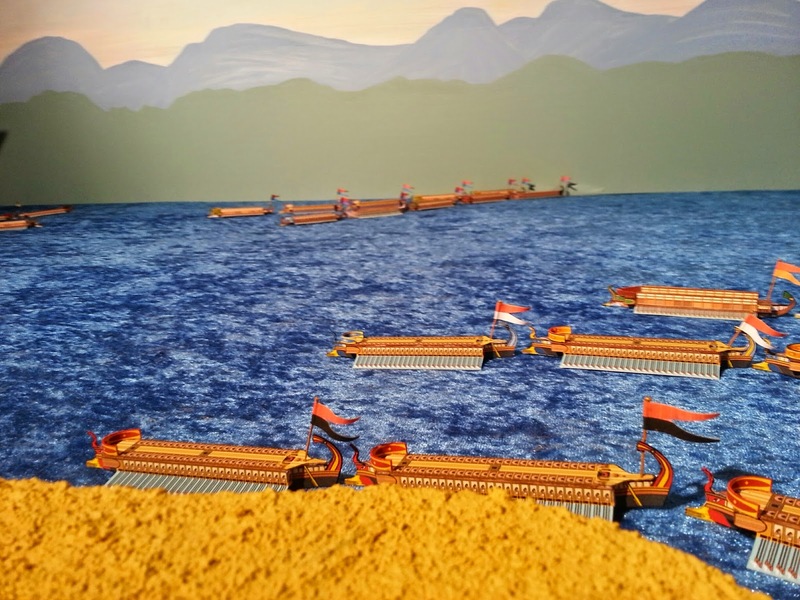 The Athenian ships were damaged at the epotides - the cross-beams which braced the front of the ship and supported the parexereisea - the outriggers which the thranites supported their oars on. 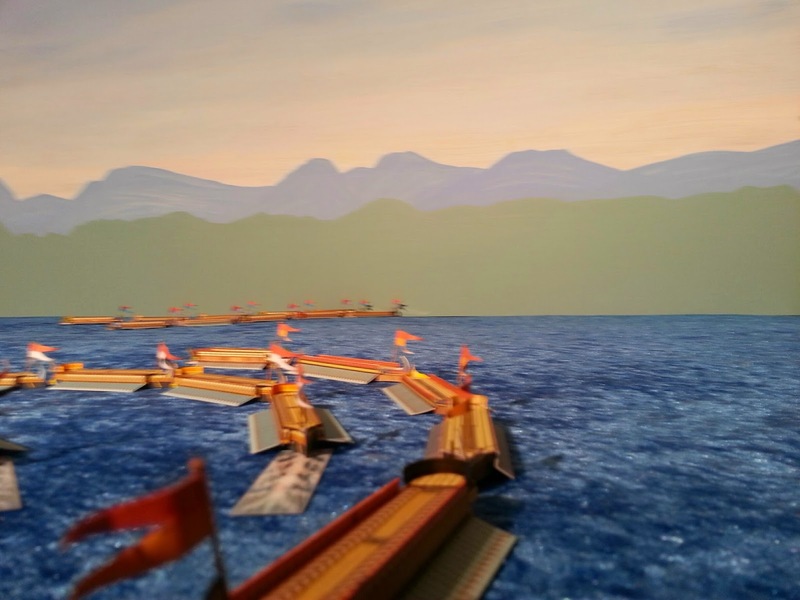 Dismounting the outrigger on opne side would knock out 1/6 of the trieres' oar power - 1/3 if the others had to stop rowing to balance the ship's progress. Translators usually have a bit of trouble with the technical terms for parts of the ship but looking at the Greek can help sort out if they are out to lunch or just confused. Diodoros Sikeliotes had to hand various authors who had previously written about the Peleponnesian War and he had his local reasons for going into the subject of the Sicilian Expedition in some detail. To this end we can find the Corinthian Modification turning up again in the battle in the Great Harbour. (Book XIII Ch.10). The instigator of the Sicilians modifying their ships is the leading Corinthian kybernetes, Ariston - according to Diodoros. Thucydides also writes of Ariston but does not mention him as an instigator of the modification of the ships. 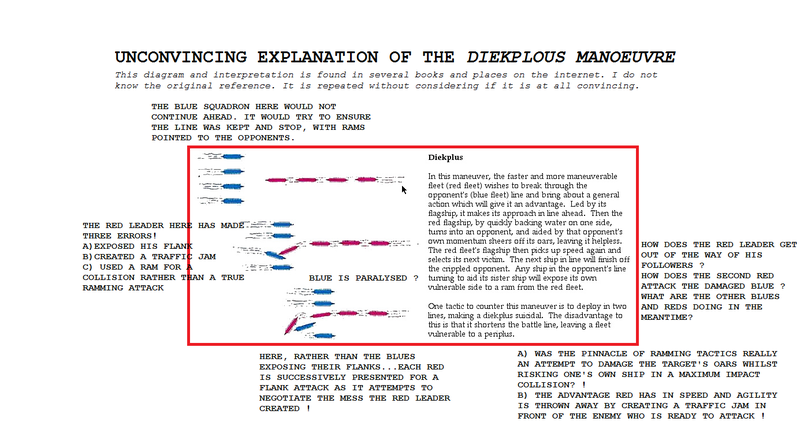 Diodoros explains the modification in some detail but seems rather confused. He describes the Athenian form of trieres as being weakly designed and too high at the prow. So high that they are designed to ram the target above the waterline. 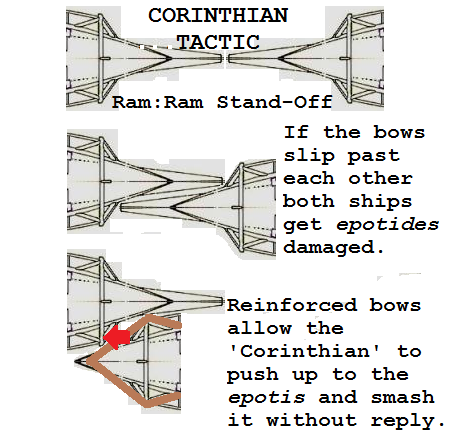 In Diodoros view the Corinthian Modification involves making the ship's prow shorter, lower and stronger. DS seems to have his wires crossed, for various reasons, but in examining what he writes it gives us some insights into the actual form of the Corinthian Modification, which supports Thucydides succinct account. I think Mr Sikeliotes did not know much about combat with trieres but had some sources who did. He uses the term 'brakuteras' of the Corinthian ships prows. Thucydides says the ships of the Corinthians had their prows shortened συντέμνω cut down, cut short. In this case, the term means more of a cutting-across or reducing in length rather than reducing in height. When we look at the word for the ship part concerned also, this is proros - the prow. Proros is the prow - the front of the bow, not the 'top' of the bow. The high horn commonly seen at the bows of a trieres has no stuctural function. Brakuteras means short in stature rather than length. Maybe DS did not understand what his source had written. He knew ships had a bow and often a focsle at the bow. 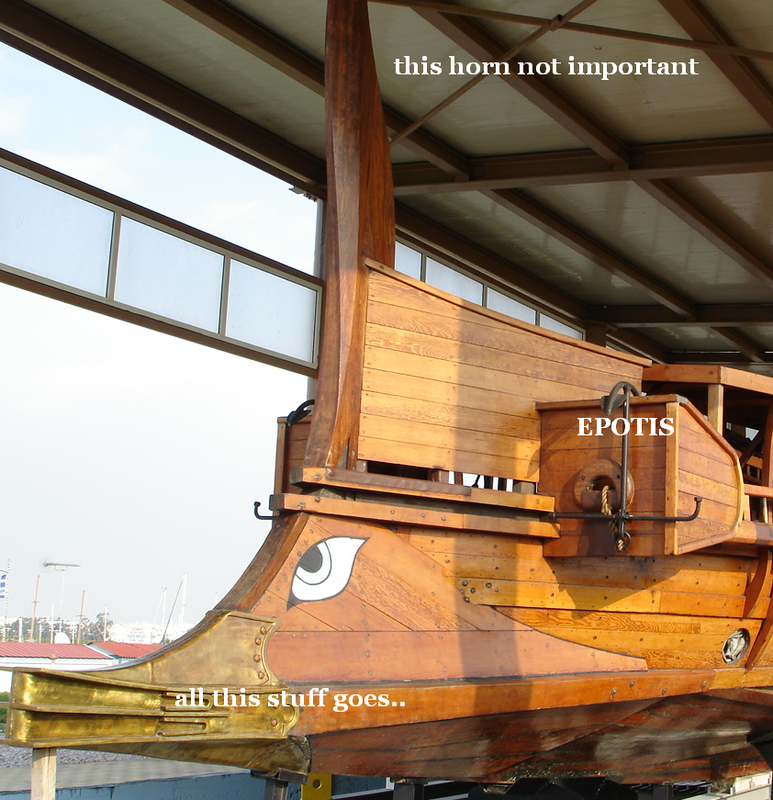 Still, at his time, the first century BC, warships had a horn on the prow - though more often now a volute. He assumed any cutting-down of ship parts here had to do with the obvious prow rather than the ram hidden at the waterline. Maybe. To explain the success of the Sicilians' new device he has to add some colourful detail to explain it. Specifically, an unconvincing account of the warships produced by the foremost naval power of the day describing them as weak and not suited to sink an opponent. His readers, however, would be even less wise about the subject than he, hence the need for explanation. A common strategy for authors using ancient texts even followed by Snorri Sturlusson in his Køngesagaer where he has to explain antique terms for his medieval audience. The sources are genuine but cannot be fully understood by the later writer, much less his audience. An explanation actually seems to confirm the author's superior knowledge. If the ship's prow is long then the chance of the strengthened epotides coming into contact with another ship's epotis are less. Taking the ram housing away, for example would dramatically shorten the bow. The stem-post is still there and the epotides can be braced together with beams as Thucydides describes. We could even speculate that the 'normal' trieres at this time did not even have any bracing for the epotis because they determinedly were not supposed to be hit head-on except by loonies. The fact that the Corinthians dared to contemplate this was their stroke of inspiration/desperation/genius. If the nose of the modified trieres can miss the ram of the opponent then it can smash its monster reinforced stempost into the epotis of the opponent. If up until then there had been no call for a reinforced epotis then it would be even more vulnerable than that on Olympias and could be smashed/dismounted. Anyway, that was some more ramblings about galleys... The last intersting thing about the Corinthian Modification is that it seems only to have been used in two locations, both with restricted waters. Chpping the cut-water off a long galley and piling a load more timber in the bow would not do a lot for its hydrodynamics. The ship would be slower, more prone to resistance from headwinds or waves and thus not perform well as a strategic weapon. The point about trieres was that they were reliably fast over long distances. Patrolling a gulf or fighting in a harbour avoided such considerations. When we hear of Sicilian trieres fighting around the Hellespont in the later war no mention is made of any special capabilities for them. Having to sail to from Sicily and work in concert with other Peleponnesian squadrons would preclude the use of the Corinthian modification. Athenians entering battle area with Peloponnesians heaving into view. Peloponnesian left enter and turn to round the Athenian-friendly shore. More Peloponnesians in the distance. View from Athenian territory. 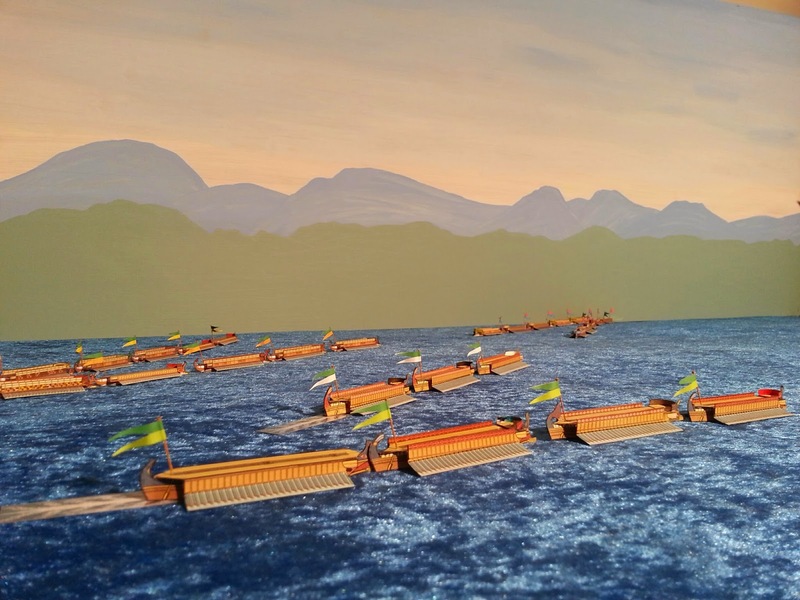 Peloponnesians advancing in file. A solution to clutter. Command boards and cards kept on book-rests above the table. Before accepting commonly regurgitated explanations of things we do not completely understand from ancient scources...think.